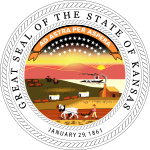 The 1980 United States presidential election in Kansas took place on November 4, 1980. All 50 states and The District of Columbia were part of the 1980 United States presidential election. Kansas voters chose seven electors to the Electoral College, who voted for president and vice president. Kansas was won by former California Governor Ronald Reagan (R) by a margin of 24 points. It is a reliably Republican state, and the last Democratic presidential candidate to carry the state was Lyndon Johnson in his 1964 presidential landslide. ^ "1980 Presidential General Election Results – Kansas". Dave Leip’s U.S. Election Atlas. ^ Fitzgerald, Thomas (February 1, 2008). "Clinton, Obama turn it down some In first one-on-one, they play nicer, spar some on Iraq". The Philadelphia Inquirer. Retrieved May 24, 2015.